The combinations of the veggies and herbs in this dish are outstanding. The healthy starches in this dish will help to keep you happy and full! With an abundance of flavors and textures, there is no need for oils and meats. I am sure you will be pleasantly surprised at how tasty, filling, and addicting these stuffed bell peppers are. Preheat oven to 350 degrees. Cut tops off of peppers and reserve, clean out the seeds, arrange in a baking tray up right, place tops back on and bake for 30 minutes. Over medium heat sauté onions, celery, carrots and zucchini in vegetable broth for 5 minutes or until tender. Stir in the cooked rice, tomato paste, and lemon juice. Add fresh herbs to the pan as well as seasonings, including salt and pepper. Stir well. 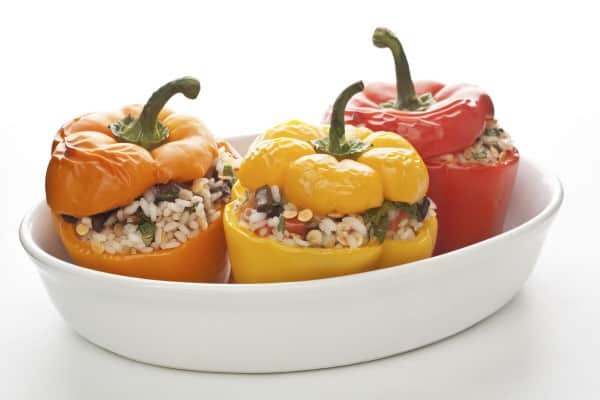 After 30 minutes and peppers are ready, remove from them from the oven and fill with rice stuffing. Place tops back on peppers, cover loosely with foil and bake for an additional 30 minutes until peppers are tender.